The GHID Barbara Lee Scholarship, is named in honor of a Houston area interpreter who was one of the first members of our organization. She was a CODA and the mother of Rita Lee Wedgeworth and Mike Lee. Barbara passionately supported and witnessed students becoming interpreters and always encouraged them to continue their professional growth. She was an advocate in making sure quality interpreter services were provided to the deaf community. She taught ASL classes at Lee College in Baytown. Later she received her Master’s degree in Psychology and worked specifically with Deaf consumers providing individual counseling and mental health services. The Barbara Lee Scholarship is set up to assist both ITP students and professional interpreters’ needs to find success in the interpreting field. Interested in giving back? Please consider making a contribution. Any donations made to the GHID general fund will be allocated to areas of need by the board. This could range anywhere from keeping costs down for professional development workshops, PO Box fees, general meeting budgets, and so forth. Interested in giving back to your community? Donate today. Make a donation below to benefit HAD’s 75th Anniversary Banquet. GHID is serving as the 501(c)3 Fiscal Sponsor, as allowed by the IRS, for the HAD 75th anniversary event, “Lasso Good Times.” Therefore, your donation is 100% tax deductible. When we receive your donation, GHID will send you a letter with all the proper tax-deductible information for your filing purposes. Thank you in advance for your support and consideration. HAD could not do it without the generosity of donors like you; even a small donation will help us reach out to the community to enhance our services. Please note that for donations made over $500, the said donor will be recognized at the event and on the HAD Facebook page. 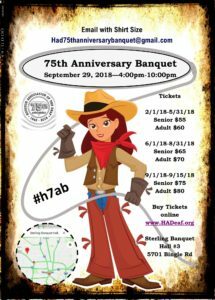 If you require additional information about HAD, please contact HAD at HAD75thAnniversaryBanquet@gmail.com, and we will be happy to answer any questions you may have. You may also visit our Web site at www.hadeaf.org.